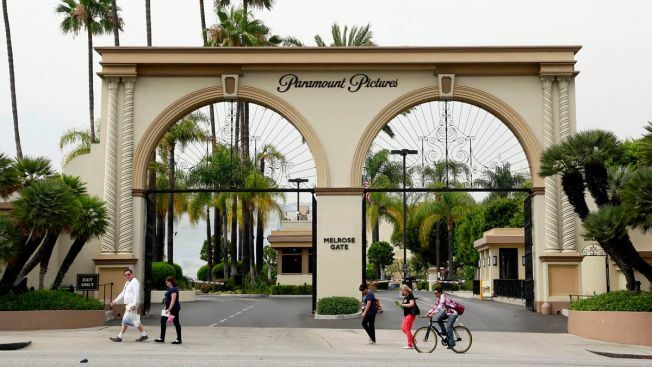 In this July 8, 2015, file photo, people pass by the main gate to Paramount Pictures on Melrose Avenue in Los Angeles. After delaying its airing in the aftermath of February's Florida high school shooting, Paramount Network is permanently scrapping "Heathers." Representatives from parent company Viacom confirmed Saturday that the TV reboot of the 1988 movie black comedy about high-school murder and suicide will not air on Paramount or any other Viacom properties. Viacom says the subject matter is not suitable in the current environment for channels it is attempting to make youth-oriented, but that it is open to the possibility of selling the anthology series to a more fitting outlet. The show based on the film starring Winona Ryder and Christian Slater had been set to premiere in March, but was delayed after the Parkland, Florida shooting that left 17 dead. The move was first reported by The Hollywood Reporter.